Jan marched determinedly along the lane toward the sea. Her right hand was clenched tightly in a fist around the ring. A clap of thunder stunned the heavens. Seven seconds earlier a jagged flash had sliced the sky. Jan blinked. But she did not take her eyes off the horizon. Even when she strode right past the dark and hollow monastery, she did not turn from staring dead ahead. Even with the sea breeze blowing straight into her face. At the end of the lane Jan found the gap in the hedge that she had created during her previous excursions. Bending down and covering her eyes to protect them against any unseen twigs, she squeezed through and out on to the brink of the ditch that marked the perimeter of medieval Wickwich. Now she would have to put her ring on, if she was to cross over to the other side. Having zoomed in, Hal was now able to make out all the detail in the map. The comparatively empty area near the centre must have been the market square. Margaret had just crossed over it and gone between two houses. These immediately became two rows of two, then two of three and so on as a narrow street took form like some extrusion stretching backward in the train of Margaret’s icon. If he had got his bearings right, Hal thought, that street was heading west. And if that was the case the West Gate should be somewhere just off the bottom of the screen. He slid his mouse and moved the map up slightly. Yes, there it was. And there was Jan’s icon passing through it. Jan was surprised to discover how much easier it was for her to find her way through the phantom city at midnight than it had been that afternoon. By torchlight the contradiction between what she saw and what her fingers told her was not so disconcerting. Paradoxically, her problem now lay not in trying to locate the invisible shapes of the past but in avoiding the unseen thorns and nettles of the present. Eventually she made it through the undergrowth and struggled out on to the windswept strip of land at the edge of the cliff top. The black monolith of the ruined tower rose up immediately before her. Hal sat transfixed as he watched the icons move inexorably toward one another up and down the screen, each spreading pools of detail like two spotlights on a page. He leant forward and looked more closely. The pools of detail touched and then began to overlap, gradually revealing the nave and transept of a medieval church. Hal estimated that the icons would meet somewhere near the bottom of the tower. 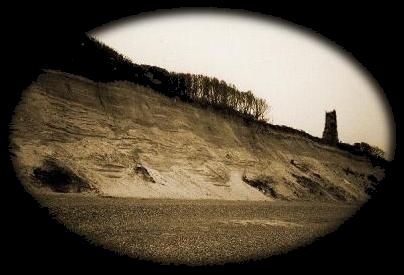 Jan had nearly reached the edge of the cliff before she saw Margaret hurtling toward her. She stopped abruptly, temporarily taken by surprise at the sight of her friend coming through the air in her direction. And then she felt the urge to turn and run. …this Margaret looked just like a ghost. Her pale, white skin and yellow hair shone with a luminescent pallor. She was radiating light, not reflecting it. And she was getting closer, very quickly. Jan stood rooted to the spot. She could not take her eyes off Margaret’s face. It was a mask of fear, despair and … hatred. Its mouth, at first wide open, as if screaming, suddenly contorted into a thin and twisted smile of vengeful satisfaction. The fear that had vanished from Margaret’s face now leapt straight into Jan’s heart and froze her blood. As she fought to catch her breath a single thought was roaring in her head. Take off the ring! Take off the ring! Her left hand moved toward her right – but far too slowly. Margaret’s ghost was bearing down on her at terrifying speed. Hal saw the icons coincide. There was a flash. The screen went blank, then flickered back immediately. The map of medieval Wickwich was complete.